International Journal of Research in Health Sciences,2017,5,3,23-27. 1Associate Professor, Community Medicine, Kalpana Chawla Government Medical College, Karnal, Haryana -132001, 2Consultant, Anaesthesiology, 3Assistant Professor, Psychiatry, World Institute of Health Sciences, Girawar, Jhajjar, 4Junior Resident, Dept of Radiodiagnosis, CMCH, Ludhiana, INDIA. Introduction: Domestic injuries, like all diseases, result from multiple causes and affect individuals in different ways. Globally, DALY’s are lost due to Falls, Poisoning, Fires, Drowning and other home accidents. Most of these injuries go unreported being minor injuries and are locally treated. The aim of this study was to find out the social and economic impact of domestic injury in the rural community. Methodology: It was a descriptive epidemiological study carried out in a rural area of Punjab. 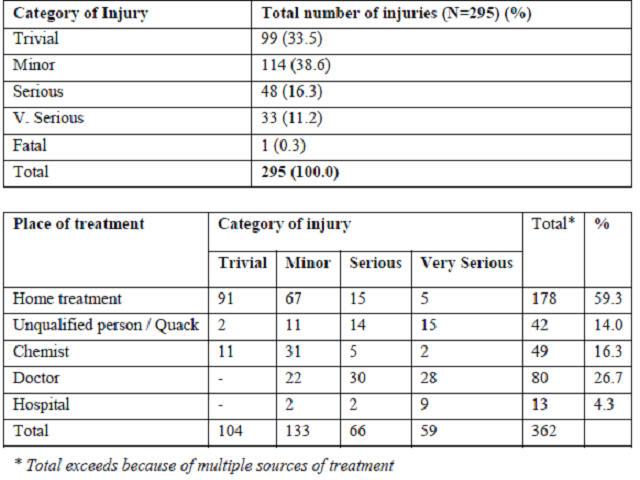 Frequency of domestic accidents was studied as per category of accident and place of taking treatment. Also the social and economic costs of domestic injuries was studied. Results: A total of 295 Domestic injuries occurred in a period of six months in the 2634 individuals studied. The average money spent on treatment was Rs. 558.40 per injury case while Rs.220.0 were spent on transport for going to the place of treatment. The average number of work-days lost were 11.95 days while the average school-days lost were 7.53 days. Conclusion: Impact of Domestic injuries can be reduced by safety awareness drives in the rural community.